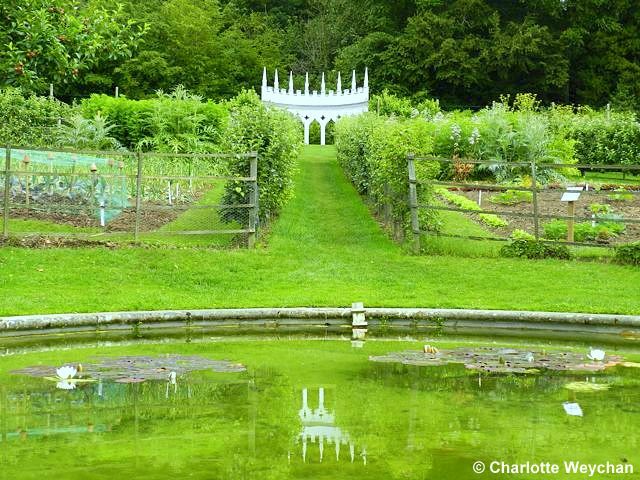 Painswick Rococo - a garden with attitude in Gloucestershire! 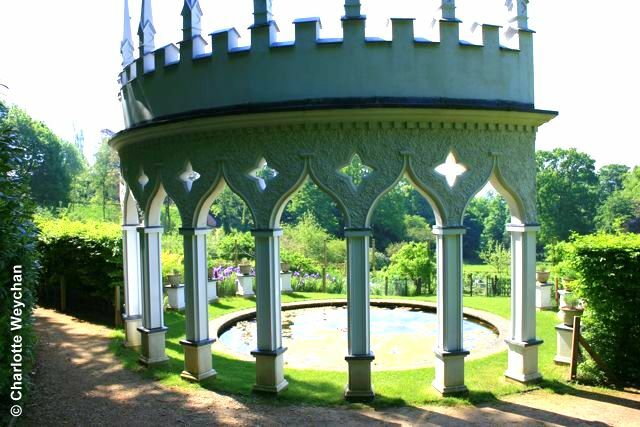 I'm sure the owners of Painswick Rococo Garden get tired of seeing this view, but it's such a hallmark of this unusual property, I doubt anyone leaves without taking a snap of the "Excedra" (above). Like the rest of the gardens here, this structure is surrounded in mystery. 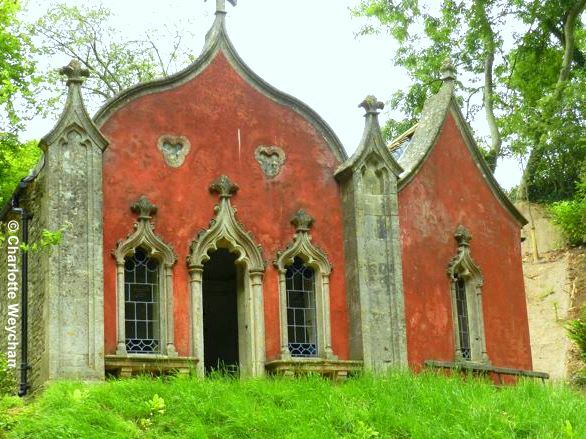 Nobody knows who designed Painswick; why the strange structures integral to its reputation are here; or indeed how it survived the many years of neglect before it was rediscovered and work began on its restoration in 1984. There's more conjecture than fact about the history of Painswick. The original garden was created in the 1740s by the man who owned the property - Benjamin Hyett - but nobody knows who designed it. 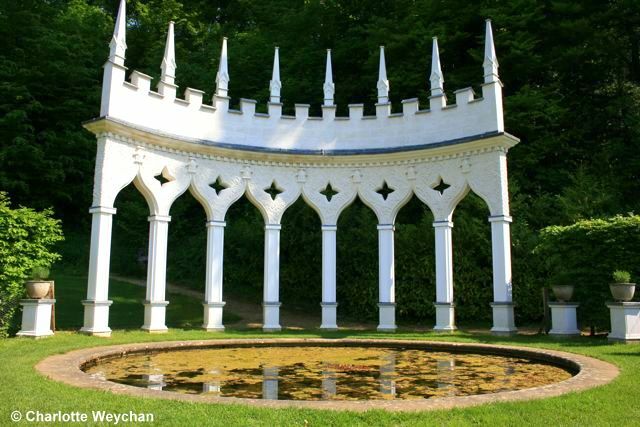 And, as the only surviving Rococo garden in Britain, there's no other property to compare it with. But a vital part of its survival is a painting of the garden, dated 1748 by local artist, Thomas Robins - which has been invaluable in its restoration. There are no other records at all. Rococo is a term used to describe the ornate style of architecture, art and furniture popular in the early to mid 18th century, but it was a short-lived movement, reflected here at Painswick in the architecture. There are no other gardens like it in Britain, and it makes for a memorable visit, from the moment you arrive and wonder where you are going; to your first view of the green valley below, which unfolds as you walk around it; and the extraordinary collection of buildings in the valley. Fortunately for garden lovers, the six-acre valley garden was rediscovered in the 1980s and an ambitious restoration programme was begun to return it to its former glory. This garden is famous for its snowdrops in winter, its glorious tulips in spring and its fabulous central kitchen garden in summer. 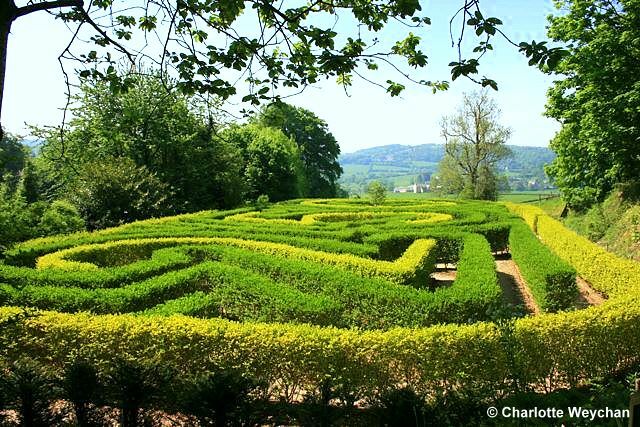 And then there's the maze, designed by crossword compiler, Angela Newing, which spells out "250" years, planted in 1998 to commemorate the original Robins painting and with spectacular views over the Severn valley. Part of the charm of Painswick is the way in which you feel as though you're lost in a secret valley here, protected from the outside world. 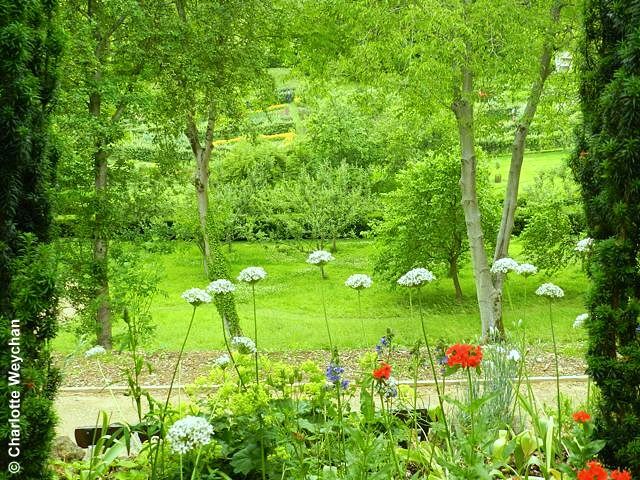 Wild flowers grow free and there are winding woodland paths at the edge of the valley, although the centre of the garden is "gardened" and the area around the Excedra is filled with flowers. Wherever possible, new planting since restoration, has been with plants that were available in the 18th century. Painswick is certainly a unique garden and one I intend to return to many times. Open from January to mid-October, from 11.00 -17.00 and with its annual "Art in the Garden" sculpture exhibition opening on 1st August - so one to put on your Wish List if you're anywhere nearby! Close enough to combine with Misarden Park or Cerney House if you're there on the right day of the week. I love it, Charlotte, such whimsy! Thankyou for a great post. Unique is certainly the correct word! Nice tea room. What a wonderful garden. I especially love The Red House. Once again, thank you so much for these wonderful garden tours that the majority of us would never be able to see and enjoy. I love your new header picture. I have so much fun reading and viewing your blog. I don't always make comments but I thoroughly enjoy each and every post. I am not usually a fan of Rococo but the house is wonderful. Also the maze with the hills in the background is a great photo. Lovely tour. We did an apple espalier training course there one day last summer, and sadly ran out of time to see all the gardens but what we saw (in the area around the excedra) was wonderful and inspiring.